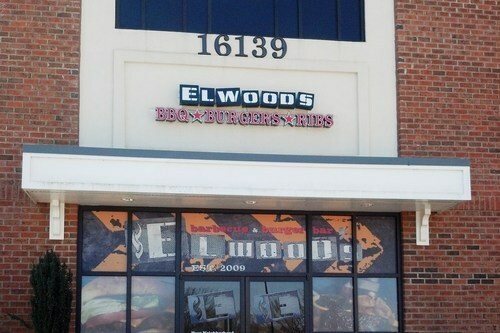 I never ate at the previous incarnation of Elwood’s Barbecue & Burger Bar (then simply known as Elwood’s BBQ) but from what I can tell I wasn’t missing much. 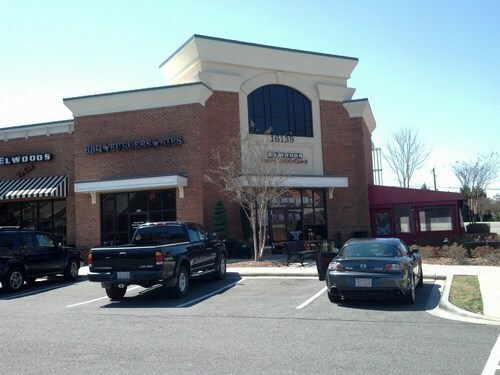 Then last fall it was purchased by a couple of brothers-in-law, one of which was a former manager at Ri-Ra, who then hired a chef who previously worked at Burger Co. As I understand it, they immediately began to overhaul the menu and improve the quality of food. 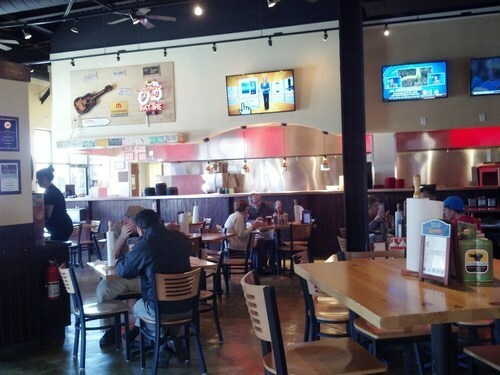 But before I get to the food, Elwood’s interior is nice and generically rustic with a good array of televisions. With a solid beer list in tow, I imagine this could be a pretty good place to watch a [insert favorite sport here] game. 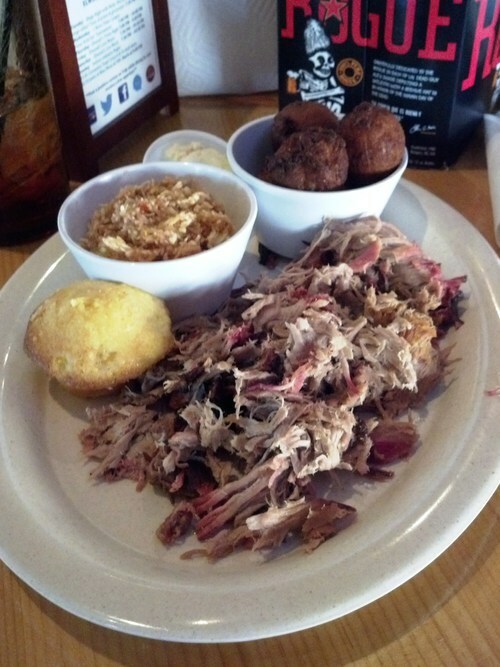 In addition to wings and various burgers on the menu, they have barbecue in various forms – pulled pork, brisket, chicken, ribs, and burnt ends. Naturally, I ordered the pulled pork with hush puppies and red slaw. The pulled pork came out in a mix of slightly dry and more moist shreds of pork. My order had decent pieces of bark (a welcome sight) that to my surprise had decent smoke. Very unexpected, considering there were no signs of a stick burner in the middle of this restaurant on the end of a strip mall. 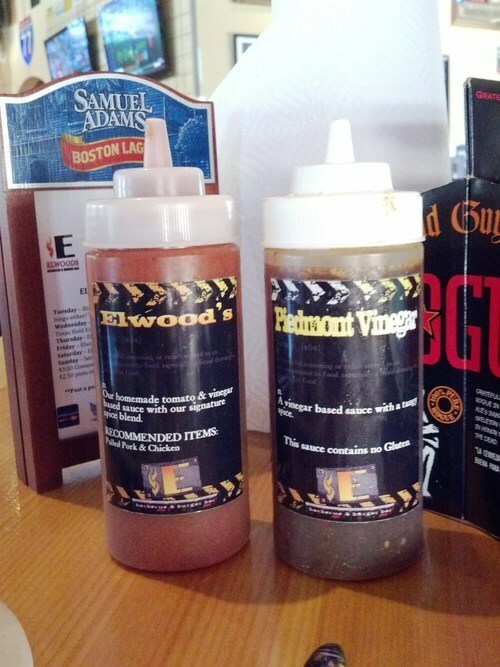 There were two pork sauces on the table: a “Piedmont” vinegar” sauce (which if we’re nitpicking was really an eastern-style vinegar sauce) and a non-traditional “Elwood’s” sauce that was tomato and vinegar-based with a special blend of spices. Of the two, the Elwood’s sauce worked best with the pork for me. 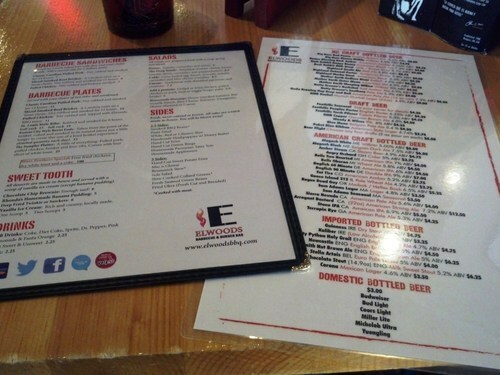 The menu states that all sides are scratch-made in house, which I can certainly appreciate. The hush puppies automatically came with a side of honey butter, which I am always happy to see. The red slaw had an off-putting brownish tint to it and had a slightly unappealing texture, so I did not finish it. Each plate order comes with cornbread, which was a little redundant with my hush puppies order but it was a nice, sweet-ish little muffin that I didn’t mind.